The upcoming summer will feature a combination of factors that has not been present for many years. This past winter we saw the return of El Nino conditions in the Pacific (a weak criteria event), for the first time since the winter of 2009-10. The El Nino has intensified significantly over the past couple months, evidenced by frequent, strong westerly wind bursts (WWB’s), dips in SOI daily values to very negative levels, and cooling water temperatures around Australia (which aids in the maintenance / build-up of higher pressures, feeding WWB’s). The SSTA profile in the Pacific indicates a classic basin wide moderate El Nino signature right now, and the latest ENSO forecast models are in strong agreement that we will see further strengthening to at least high-end moderate levels (1.3-1.5c in region 3.4 of the tropical Pacific). The question becomes: does the El Nino reach strong status, and can it possibly attain “super” Nino criteria (2.0c or greater in region 3.4)? Based upon the recent trends, the uptick in strengthening has not been as impressive as super Nino years like 1982 or 1997, for example. However, it’s possible that this El Nino becomes the strongest Nino event since 1997, with peak region 3.4 temperatures slightly warmer than the low-end strong El Nino of 2009-10. This will be a double / second year Nino, since the winter of 2014-15 already featured a weak Nino. The analogs for this type of occurrence are not numerous; there’s very few years that share similarities in terms of ENSO progression. It is possible that the El Nino peaks relatively early – late summer/early autumn – much like the 1986-88 double Nino event which featured a region 3.4 peak of approximately +1.75c in late summer. Many of the forecast models are supporting that notion. The latest IRI model mean is projecting a +1.5c peak in early autumn with a weakening trend to +1.2c by the middle of next winter. Of that model mean, the statistical guidance has a moderate Nino peak of +1.2c while the dynamical model mean has a strong Nino peak of +1.7c. Both sets of model data fall under the 2.0c, super Nino classification. While it is still a somewhat fickle time of year for model data, I think it’s unlikely that we’ll see a super Nino on par with 1982, 1972, or 1997 intensity. We don’t appear to be strengthening quickly enough, and the conditions for rapid intensification are not ideal. However, currently, I would anticipate high-end moderate to possible strong Nino conditions by later this summer. Thus, one will notice that my chosen analogs do reflect the opinion that the El Nino will reach strong criteria. Northern hemispheric teleconnection indices such as the NAO / AO become less important in the summer months in terms of their correlation with CONUS weather; however, they still do play a role in determining the overall ridge/trough orientation. The PDO and EPO are important indicators that have been mentioned quite a bit lately, especially given their role in this recent winter’s excessive mid-level ridging over Alaska. Right now, the PDO remains in a strongly positive modality (+1 to +2). Looking back through history, there were not many oncoming moderate/strong Nino’s with strongly positive PDO’s. 1965, 1972, and 1982 were all strong Nino’s that featured neutral or negative PDO’s (cooler water in the NE/E PAC). The most similar years in terms of the expectation of a moderate-strong Nino and +PDO state are 1957, 1987, and 1997. Interestingly though, there’s an inverse correlation between the PDO and temperatures for much of the USA during the summer months. 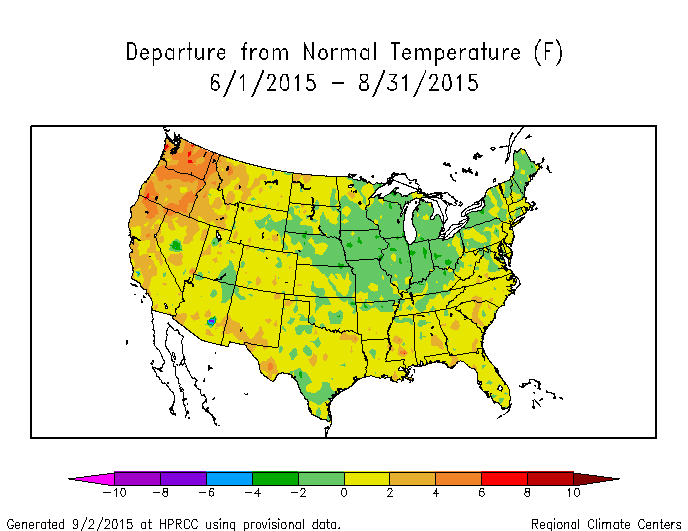 This implicates that a +PDO tends to induce cooler than normal temperatures across much of the United States. The EPO has been predominately negative (for most of the past two years), and looks to remain that way overall in the coming months. The analog years featured a dominating –EPO, as it the case in the majority of strong El Nino summers, and like the winter season, -EPO signals the maintenance of the mid-level ridge near Alaska/NW Canada. Forecast modelling, the SSTA profile, and tropical forcing also supports the continuation of West Coast ridging in the means for June-July-August (JJA). However, there will be some variation of that mean regime over the coming months. With regards to sensible weather conditions, oncoming strong El Nino’s featured an active sub-tropical jet (STJ) which often delivers copious rains to the South/Plains and MS/OH valleys – as we’ve already seen this month (record wettest May in parts of Texas). A pattern of wetter than normal conditions should persist for much of the South/Plains, and extending into at least interior portions of the Eastern US for the summer months. 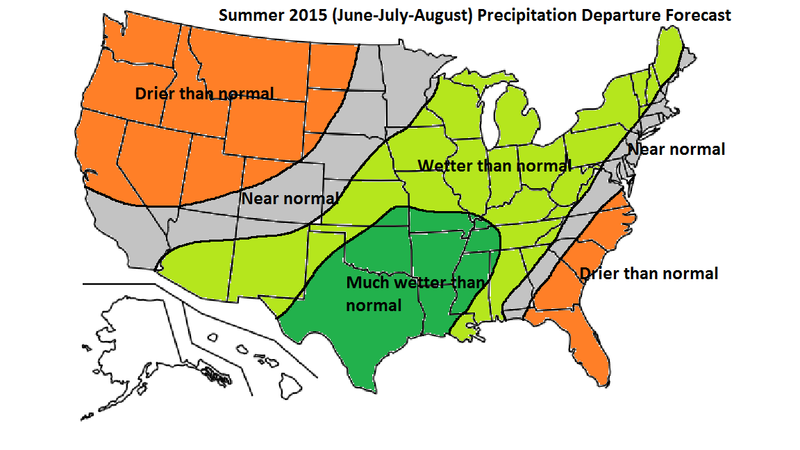 The SW US should see an uptick in precipitation later this summer. 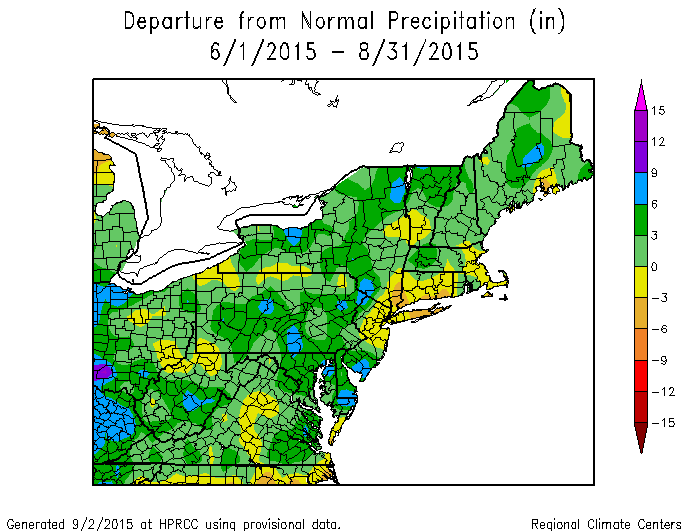 The East Coast is a bit of a wildcard because some strong Nino summers feature a wet pattern, while others are dry. But by and large, the majority of years err on the drier side of normal for the immediate East Coast, with wetter than normal further inland. The May pattern is not necessarily correlated to the JJA mean precipitation pattern, but given the expected trough/ridge orientation, a tendency for dryness might occur near the coast. Temperature wise, the anticipated –EPO/+PDO/Strong Nino regime tends to produce coolness from the SW US northeastward through the Plains and Lakes, with warmth in the NW US and SE US. 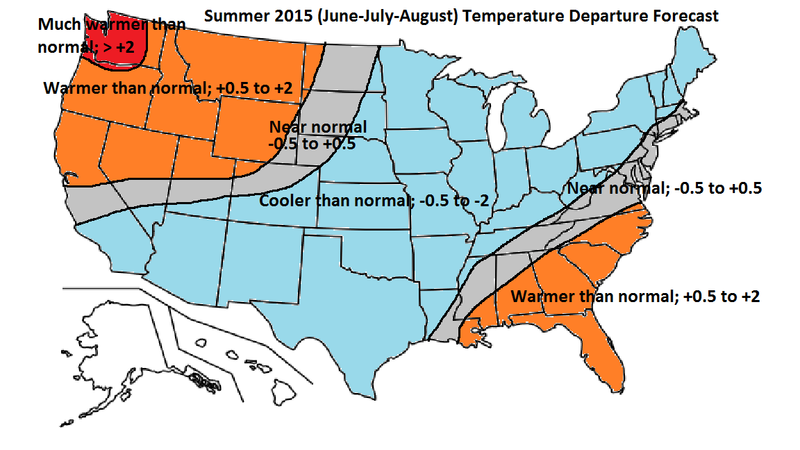 The Northeast US should see a summer similar to last year – fairly temperate – and maybe slightly warmer. 90F degrees should be lower than normal once again in the Northeast corridor. If there are any heat waves, they will probably not be prolonged. The mean NAO/AO states should transition neutral to negative for much of the summer, and this is supported by analogs and model guidance. The totality of factors yields the following sensible weather result. One month of the summer could be quite cool relative to normal in the Northeast – likely either July or August. This should be an active summer for convection given the mean trough position near the Great lakes and SE-ridge resistance to the south. Overall, I think this was a good to very good forecast nationwide for both precipitation and temperature. In the Northeast, precipitation totals were higher in the interior Northeast with respect to normal, which was expected. Temperature departures were cooler in the interior Northeast as forecasted. JJA temperature departures for the NJ-NY-CT corridor were generally 0 to +1.5 for most locations. However, some immediate urban areas exceeded +1.5 for the summer. Thus, for these areas, there was a larger discrepancy between outlook numbers and actual. For the vast majority in NJ-NY-CT corridor, departures finished slightly warmer than anticipated. The idea of the two major hot spots relative to normal being the SE US and NW US verified, with the coolness in the Mid-west/Lakes. 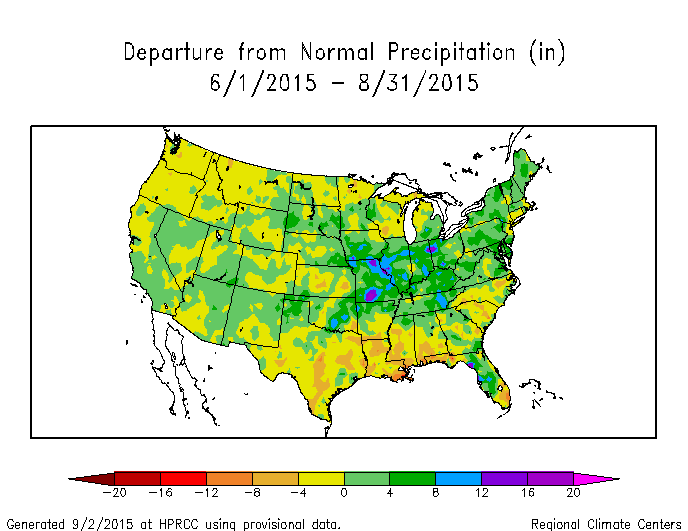 Precipitation was good except for the southern Plains/southern MS valley, which finished drier than anticipated. One can see that some/most locations finished slightly warmer than normal, while immediate urban areas like Central Park had a much warmer than normal summer. This is due in large part to the high frequency of dry days / nights with light winds, thus allowing suburbs to cool more effectively via radiational cooling.